Warning: The local cave rescue organisation have reported that the entrance to Grotte Chevalier is currently prone to blockage, being down a frost-shattered scree slope. If the way in is not evident, then keep out. If you do venture in, ensure that you carefully take note of exactly where the exit is on the wide scree slope. This expedition is for the young at heart, and the agile, and has as its target the inner depths of the spectacular Grotte Chevalier. Chevalier was the leader of the team that undertook the main explorations of the Dent de Crolles caves during the war. The cave that is named after him was always obviously very much part of the main cave system, but was only recently connect to it. The time is for the ascent and descent, and allows for a full exploration of the cave. This half day expedition starts with an exciting traverse under the summit cliffs of the Dent de Crolles, and has as its climax, a trip deep into the heart of the mountain. The route to the cave is exposed, and should be avoided if you feel uncomfortable in such conditions. The cave is fairly long, but safe provided a few basic precautions are taken. A minimum of three people should descend, one of whom should be experienced in caving, and all of whom should be equipped with some head protection (a balaclava will do), a warm jersey, and most importantly, a head lamp (preferably of the Petzl variety), and at least one spare torch. Unlike most caves, there is no risk of getting muddy or wet. It is also useful to take some fluid, as such dry caves can be very dehydrating. The Chevalier is located immediately under the summit cliffs, in the eastern face (map). Park at the top of the col du Coq (1434 m grid ref. UTM 31T 72238 50205), and follow a path through the woods towards the Dent de Crolles (it divides after a few metres - keep to the right). This take you onto the pastures beneath the impressive summit cliffs, which are are a riot of colour in the spring. Follow the track up to the col des Ayes (1538 m), reached some 20 minutes after leaving the car. ¹ From here follow the zigzags up the pastures, ignoring the turn off to the Trou du Glaz, along the path which leads to the Pas de l'Œille. After climbing about 150 metres, the path crosses a shallow scree gully. Instead of following the main path across this, descend slightly as you cross, and you will meet a lower path. This path crosses the pasture, and then finds a thin line between the summit cliffs and the steep valley below. The route is obvious, but exposed, although some of it is equipped with cables. The most impressive section is where the path rounds the nose of the cliff, where you will be traversing on shale ledges. You should listen out for stones falling from the cliffs, all along this path. They do give fair warning by whistling at you during their descent. The section before the nose was subject to a massive rockfall in October 2010 which took out 150 m of path. So be warned! From the nose, follow the path round for a couple of hundred metres. The Chevalier is on a platform 30 metres or so above the traverse, and is accessed by a thin ascending path through the loose scree and vegetation. 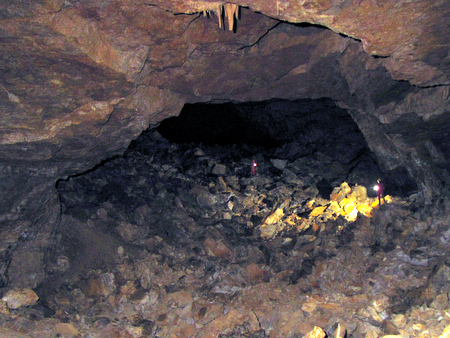 Local commercial caving groups sometimes leave fixed ropes on the route. The grotte Chevalier is in a very loose frost-shattered area of cliff, where there is no real room to sit down and have lunch. Traversing back under the cliffs at the same level for a hundred metres or so, however, leads to a platform in front of the grotte Annette, named after Annette Bouchacourt, one of Chevalier's team who was killed in a skiing accident. This provided the original connection with the main Dent de Crolles system. However, be warned: the Annette should be avoided for casual exploration, as the entrance passage leads to a scree funnel which is is liable to slumping, and the route beyond is not straight forward, and becomes somewhat technical. The platform, though, is a perfect place for a picnic, with excellent views into the valley below, and the Belledonne hills opposite. If you do wish to explore the caves a little further and have the equipment listed above, you should return to the Chevalier. The entrance descends steeply down loose frost-shattered scree, and care should be taken not to bang your head. At the bottom of the slope is a little clamber over a boulder onto a continuation of the slope which debouches into the main passage proper. This starts with the generous dimensions of about 4 metres wide, by about the same high, but a couple of hundred metres in, the passage becomes overwhelmingly huge - thirty metres wide, by 10 metres high. Traversing this passage is slow, having to negotiate large blocks that have fallen in from the roof, and it drops fairly steadily. It continues thus for three quarters of a kilometre into the heart of the mountain, reaching a depth of 160 metres below the entrance, until it somewhat anticlimactically finishes in a blank wall. By this time you have traversed over a third of the distance to the Guiers Mort at the head of the Perquelin valley, and have some 400 m of rock above your ahead. However, the cave does connect with the rest of the Dent de Crolles system, and if you're lucky you may see some cavers appear from the roof, abseiling down a 25 m shaft near the end, having traversed through from the Trou du Glaz. Unfortunately, the cave is totally devoid of stalagmitic decoration, but early in the season, impressive ice formations may be found. The journey out is somewhat hot and tiring; it can also be problematical. What you don't tend to notice on the way in are two side passages - one half way in, and one a couple of hundred metres from the entrance, both being on the right as you descend. The problem with both is that it is all too easy to enter them by mistake on the way out, which can lead to some disconcerting moments. The mistake is more likely to made in the first. This is where the passage is at its widest, about 40 metres, and you tend to lose all touch with the right hand wall. You will soon realise your mistake when the passage becomes smaller than you remember. Don't worry - simply retrace your steps back to the main passage, and turn left. You can also make the same mistake nearer the entrance, but again just retrace your steps. Towards the entrance, simply climb the boulders and the scree, and you will soon reach welcome daylight having descended into the heart of the mountain. The traverse beneath the summit cliffs of the Dent de Crolles towards the Grotte Annette that y ou describe seems to have fallen into disuse in favour of a path 50m lower down the hillside. The lower path is a more logical route on the return and is less exposed than the upper one. It is now more worn and clearer to find but there is no security cable but does not need one and a cairn is developing at the start. The upper path is growing over and it is only the presence of the cable that gives confidence that one is on the correct path. The cable has become quite frayed at the far end belay. To return along the upper path requires keeping high on fading steps to find the correct level.